The Ross lectern is a touch screen interface giving you control of nearly everything that happens in the classroom. The angle of the monitor can be raised or lowered into the podium. 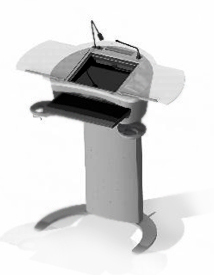 The height lectern can be raised and lowered to fit the height of the presenter. Two separate screens can be displayed at any time. You can run a video on one screen and a PowerPoint on the other. Or you can have two different applications or webpages displayed on each screen. Straight from the touch screen on the lectern, you can control the lights, computer volume, microphone volume, and even open or close the window blinds. Lectures can be recorded using simple selections on the lectern touch screen, then posted for your students.